In 2009, one of the oldest Russian cities, Veliky Novgorod solemnly celebrated its 1150-year anniversary. In Russia it is called Mr. Novgorod the Great – this is the true Russia, the Ancient and Primordial Russia. Such basic words as “Rus”, “Russia”, “Russians” take origins from these places. From here had started the ruling dynasty of the Grand Dukes of the Rurik, which then reigned in all ancient Russian cities and lands for more than 700 years. Novgorod is the city, from which the great trade route “from the Varangians to the Greeks” began. It had not only contributed to the blossoming of many Slavic cities, but also allowed the later merging of the Eastern Slavic tribes into Kievan Rus. Novgorod itself became the largest international trading city. Ancient Novgorod laid the foundations of domestic urban improvement. In 1136, Novgorod established a kind of political system – a boyar republic. The supreme authority was the people’s assembly of the Novgorodians – the Veche. It resolved questions of peace and war, elected officials, concluded treaties with the princes, and resolved many questions of domestic policy. But ancient Novgorod was not only a trading and military city. It was also an outstanding center of Russian culture, not affected by the Tatar-Mongol invasion. Today, Novgorod is a modern city not only with a developed economy, but also with a modern tourism infrastructure. After all, Novgorod – this is the richest city-museum, which has world-wide significance. Therefore, in 1992 the XVI Session of the UNESCO General Assembly decided to include all architectural monuments included in the Novgorod Museum-Reserve into the World Cultural Heritage List. 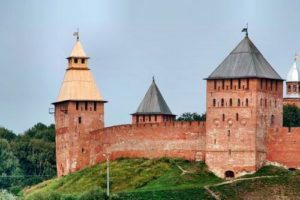 You will visit the the old Russian city – Novgorod Veliky, which was an ancient center of trade and crafts, and also a birthplace of the Russia democracy. Novgorod Kremlin counts more than 1000 years of it’s history. The Sofia Cathedral is located inside the Kremlin, it was built by the Duke Vladimir more than 900 years ago, and was the main cathedral and the symbol of Novgorod republic. The museum of wooden architecture Vitoslavitsy carefully preserves the real wooden houses and churches, collected around north-east region. You will get aquainted with the rules and habits of the peasants of old Russia. The museum of icons offers a great collection of the russian icons of XI-XV centuries. This tour will leave a true memorable experience. Tour duration – 16 hrs.